Medical ID jewelry, engraved with your vital medical information, can mean the difference between life and death. First responders and other medical personnel look for them in an emergency. When you can't give your medical history, these pieces of jewelry alert them that you have vital health issues. 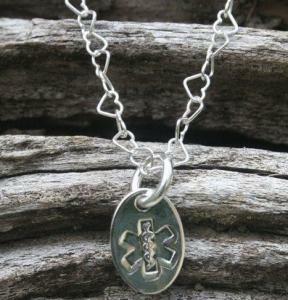 Medical ID jewelry is available as bracelets, necklaces and anklets, including options for men, women or children. Look for the jewelry in hospital gift shops, pharmacies, department or jewelry stores, or online sites. Choose from a variety of styles similar to regular jewelry. There are sporty or casual options as well as designer style jewelry in various materials. Except for full rubber sports bands, the medical ID portion is usually made of metal and comes in a choice of sizes and shapes. Some medical jewelry has the metal ID already engraved with a single diagnosis or allergy. Rubber sports bands are usually pre-impressed or imprinted with simple information. 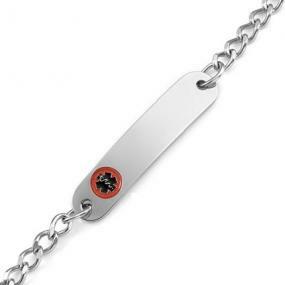 Alternatively, you can buy jewelry with a blank ID plate and get it custom engraved with more information. The price of the jewelry usually includes the engraving. Look for jewelry with the ID engraved with the medical alert logo: the six-point "Star of Life," the universal emergency medical services alert symbol, usually overlaid with the "Rod or Staff of Asclepius," the universal symbol of the medical profession. Store your medical information: If you buy your medical ID jewelry from an online company such as MedicAlert Foundation they will store your additional medical history. In case of an emergency your information is accessible to medical personnel 24 hours a day and is available in several other countries if you are travelling. USB Drive: The American Medical ID company makes medical ID dog tags that are USB drives you can wear on a necklace as jewelry. They engrave your vital information on the ID plate. You enter details of your medical history on the USB drive which comes with pre-loaded medical forms that are easy to complete and store on the drive. Bracelets are the most common and recognizable type of medical ID jewelry. There is a wide variety of styles and materials to choose from which makes it easy to find one you like. You can wear one on the same wrist with your regular bracelets if you want to. You can find medical ID bracelets in a variety of similar styles and materials as regular jewelry. This includes charm bracelets and bangles, where the hanging charm is the medical ID. 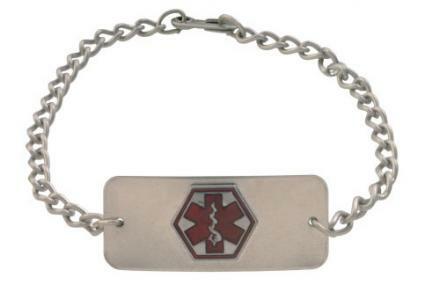 The Stainless Steel Medical ID Alert Bracelet is a classic bracelet with a standard flat, rectangular, metal medical ID plate attached to a chain link bracelet. Made entirely of stainless steel, it is suitable for men and women and sells for about $28 at the Medical ID online store. The front of the ID has the medical alert logo and you can have the ID engraved with four lines of medical information on each side. This Bling Jewelry Stainless Steel Two Tone Medical ID Bracelet retails for just under $30 on Amazon. The stylish fashion bracelet has alternating silver and gold-plated 6mm stainless steel balls. The slightly curved stainless steel medical ID plate can be engraved on the front and back and has the medical alert logo on the front. A medical ID necklace is a good choice if you prefer your ID to be less conspicuous. The downside is that in an emergency it might not be as visible to emergency responders as a bracelet. The metal medical ID plate engraved with your medical information is worn as a pendant and sizes and shapes are similar to regular pendants. The necklace is usually made of a matching metal or you can use your own necklace. This Sterling Silver Oval Medical ID Necklace is an oval sterling silver charm pendant with an 18-inch, heart-linked sterling silver necklace. The oval medical ID pendant has the medical alert logo on the front and can be engraved with up to four lines on the back only. It is available from the Medical ID Store for around $40. 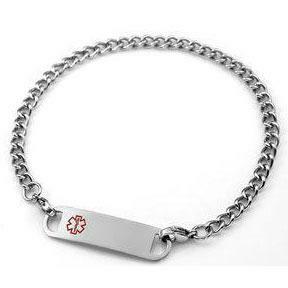 The Heart Stainless Steel Medical ID Necklace is also found at the Medical ID Store and sells for about $30. It has a heart-shaped ID plate attached to a 24-inch detachable stainless steel chain, which is interchangeable with other necklace and bracelet options. The plate can be engraved on the back only and has the medical alert logo on the front. It is also available with a smaller alert symbol on the front so both front and back can be engraved. This Silicone USB Dog Tag is a silicone-encased USB drive which can be worn on a necklace and costs about $45 from American Medical ID. The medical alert logo is on the front and for $7 they engrave your vital information on the metal plate on the drive. You input your medical history on pre-loaded medical forms on the USB drive. There is also a full metal version of this USB dog tag for the same price. There are fewer options available for medical ID anklets. They may be a better choice for women who work with their hands and might find their ankle a more convenient, safer place for a medical ID. Anklets might be less visible during an emergency, however. Anklet styles are limited to small metal chain-link bracelets with a metal ID plate or a charm anklet. Alternatively you can just buy a medical ID charm and hang it from your own anklet. The Stainless Steel Long Medical ID Anklet Bracelet is a classic style rectangular ID plate attached to a small stainless steel chain link anklet. It retails for about $30 from the Medical ID Store. A small alert logo is on the front. You can customize the ID with four lines on the front and the back. Instead of the flat plate you can choose a heart emblem in stainless steel or gold-plated. This Yellow Gold or Silver Anklet with Red Medical Symbol - Hearts anklet in 14K gold or sterling silver has a double hearts design for the medical ID plate and retails for $124 at Elegant Medical Alert online. You have a choice of different styles of 9-inch chains for the anklet portion. The heart ID plate has a medical logo on the front and they engrave your information on the back. The price includes a medical alert wallet card. When you can't speak for yourself let your medical ID jewelry speak for you. This will ensure that your vital medical information is communicated quickly when your life is at risk.